There was some confusion recently in the comments here on AAWP over whether Office applications offered full functionality (including editing and creating) under Windows 10 Mobile in 2018. I decided to investigate and the results are below. In short, as I expected (and stated originally), you can still edit and create documents for free, but in fairness there are some restrictions. Which I list/show in definitive fashion, so hopefully this page is worth a bookmark. 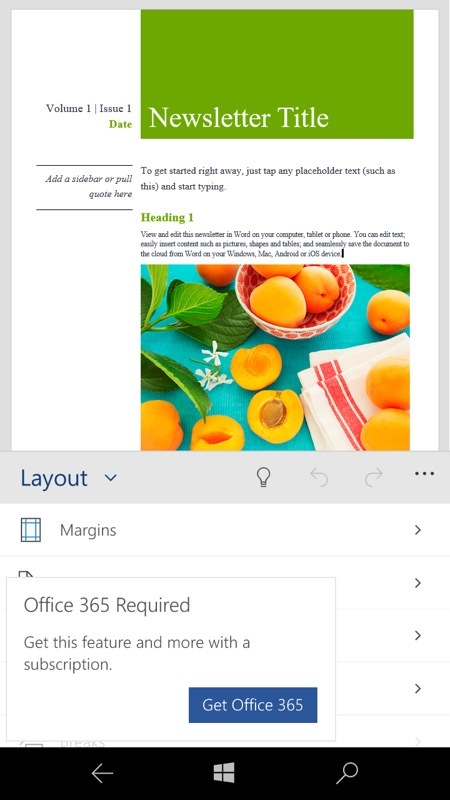 Confusion reigned in the comments because most AAWP readers have an Office 365 subscription by now and so never see what the casual user sees on their phones, and/or are remembering how Office Mobile used to look and behave a few years ago. 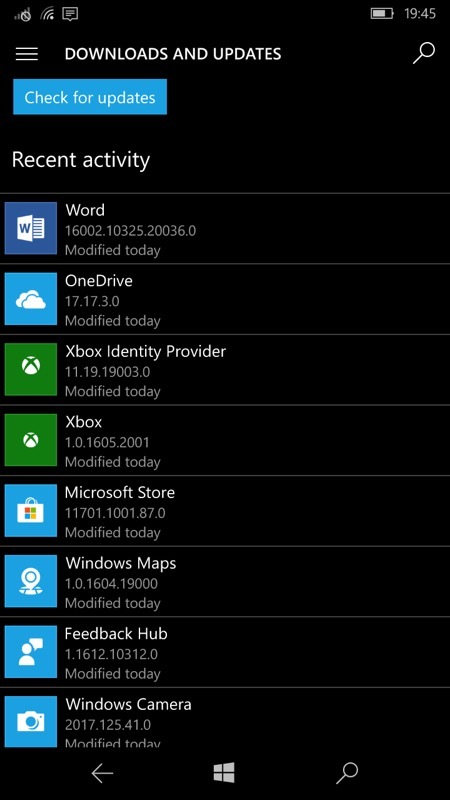 Interestingly - 'and not a lot of people know this' - the versions of Word, Excel, Powerpoint and most other big apps that 'ship' with Windows 10 Mobile are actually included as stubs, as here, and then updated in the Store over the next few hours to the 'actual' applications. Which means that if you tap through - as here - fairly soon after the initial device set-up, you see the 'stub'. 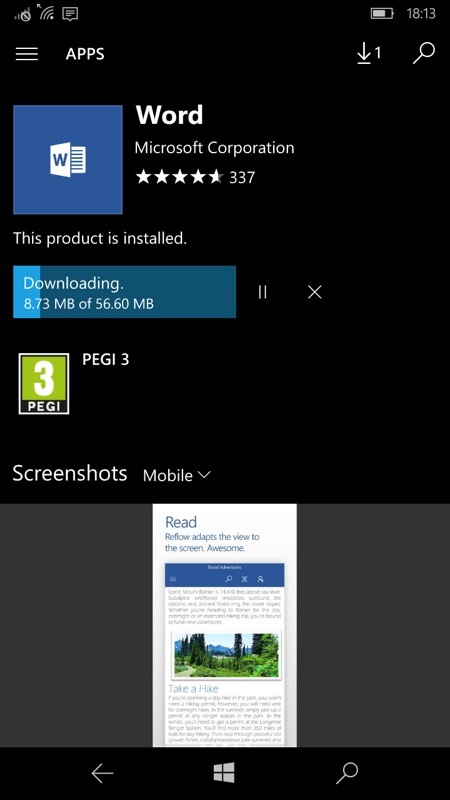 Happily, it's trivial to tap through to download and install manually! All installed and time to start up Word - with the usual three screen mini-tutorial, followed by the 'Start using' button. Notice the grey, understated 'Upgrade now' control at the bottom, by the way, I'll come back to that below. 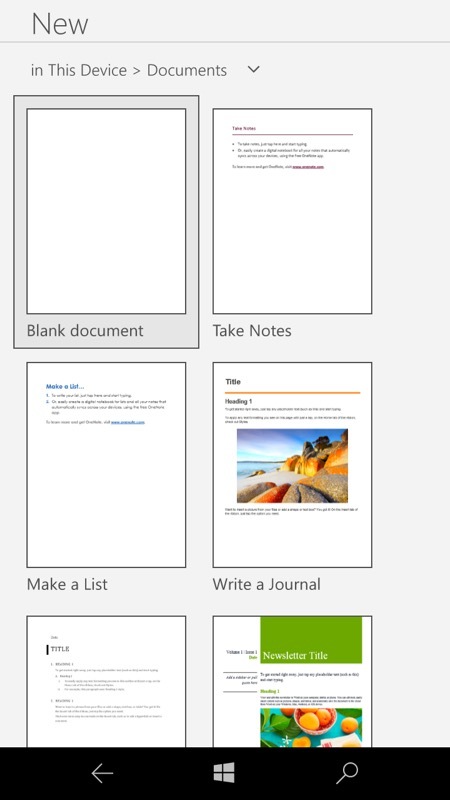 I noted instantly that I could create documents, either from a blank sheet or using one of the many templates; (right) happily editing, saving, and generally using Office Mobile, all without an Office 365 subscription. I was curious as to what would happen if I used the original 'Upgrade now' control or (not shown) the similar function on the main Office hamburger menu - you're taken to this Office 365 intermediate splash page, extolling the product's virtues. 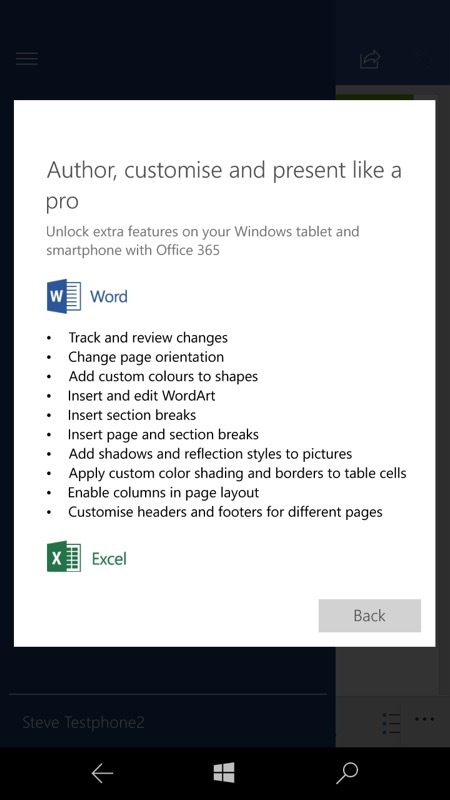 My attention was then drawn to 'Unlock extra features on your tablet or smartphone' - now we're getting somewhere; (right) this brings up the full list of extra functions you gain in the UWP applications when you're also signed up to Office 365. Don't worry about reading the graphics, by the way, I've transcribed it all in a table below! Just to be sure, I tried one of the claimed extra functions on this newly reset and non-subscribed phone - and I got this pop-up. Which is fair enough. 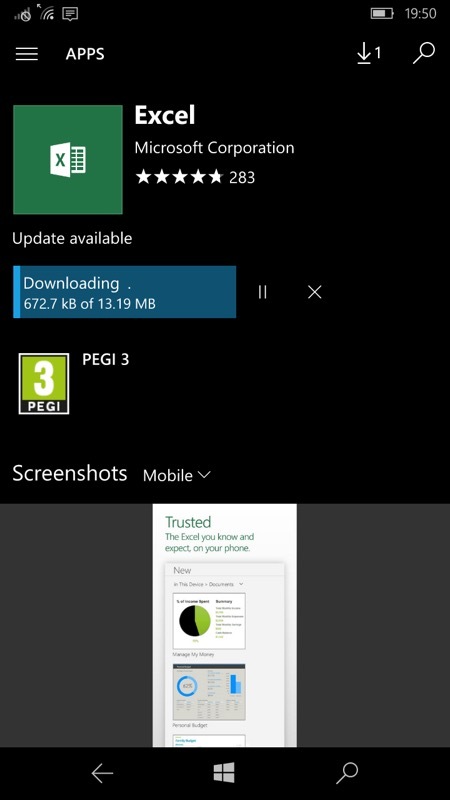 Casual Word, Excel and Powerpoint phone users won't hit this pop-up very often; (right) all of the above also applies to the other Office apps - here I'm upgrading the Excel 'stub' into the full Excel UWP application in the Store. And again, Excel is fine for creating spreadsheets, editing and most formatting, all for free on the phone; (right) as with Word, you can tap through the 'Upgrade now' function to have the Office 365 subscription extras listed out (again, see the table below). 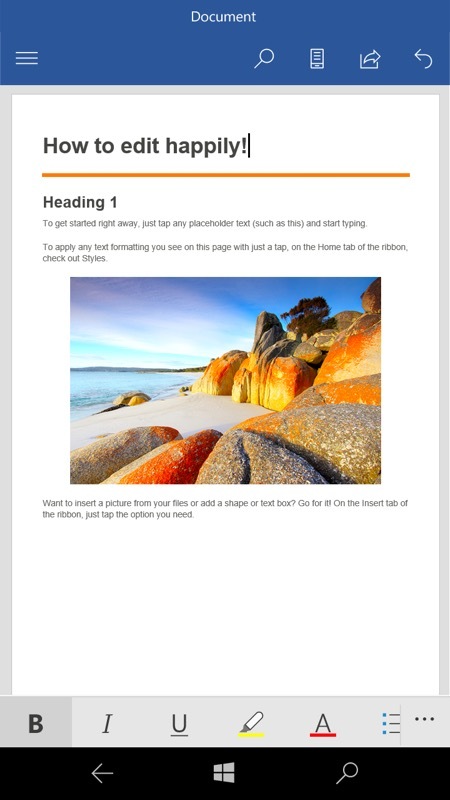 These extras definitely seem to me like features and functions that you'd use more on a bigger screen, typically when creating a larger and more complex document. 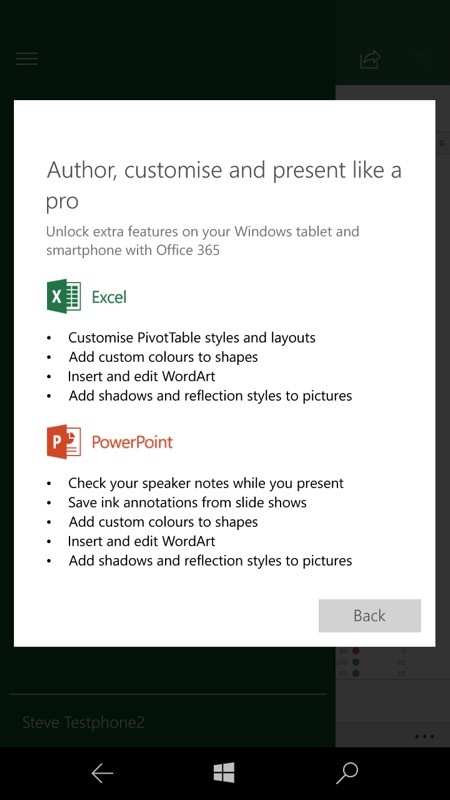 So in this regard I think that Microsoft has chosen its 'out of the box' feature sets for Word/Excel/Powerpoint Mobile well. What you do get on the phone for free is very much all you'd want to do on the phone! Paying to upgrade* in order to add the features in the table seems to be something you'd only consider on a Windows tablet. 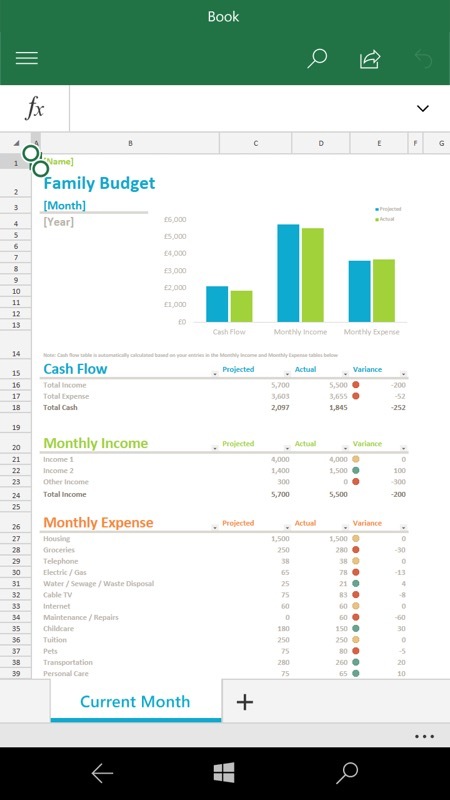 In short, then, as promised by Microsoft originally, you can indeed edit and create in Office on the (standalone**) phone without paying a penny to Microsoft, of course you can, you just don't get the advanced features listed above in our definitive table. 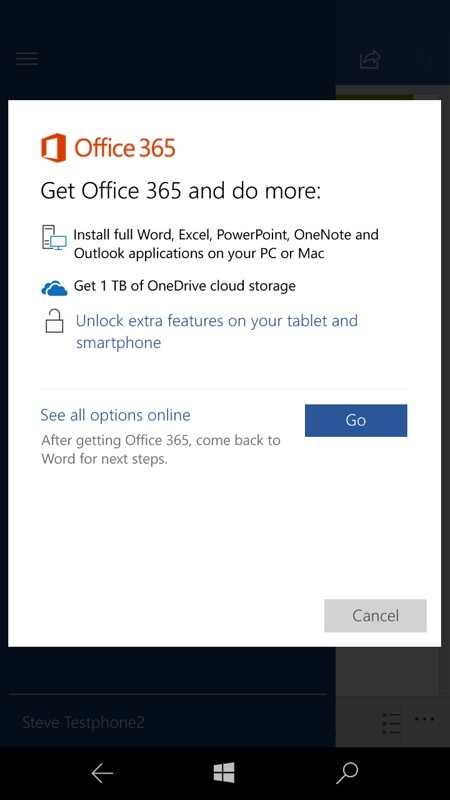 * Of course, there are other reasons to upgrade to Office 365, it's good value, not least that 1TB of cloud storage as part of the deal, plus the full licensed Win32 version of Office on your desktop. ** Someone is, of course, going to point out that plugging in the small screened phone into a Continuum display might get you the editing/creating capabilities yet with a much larger display than 10". 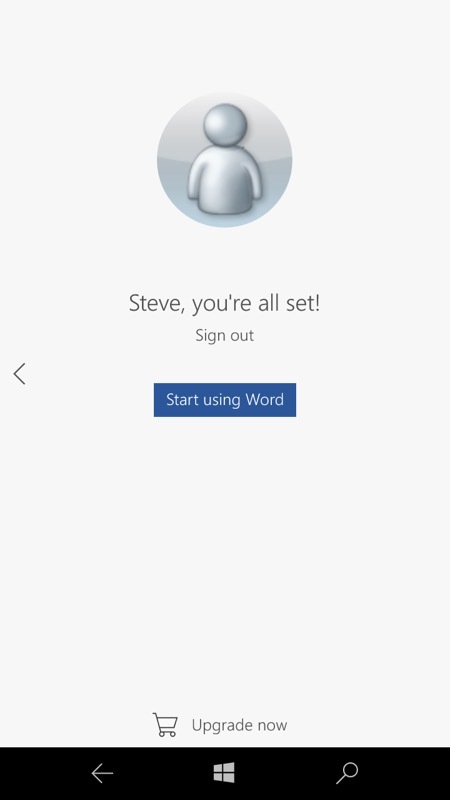 Not so fast, Microsoft has thought about this niche use case. 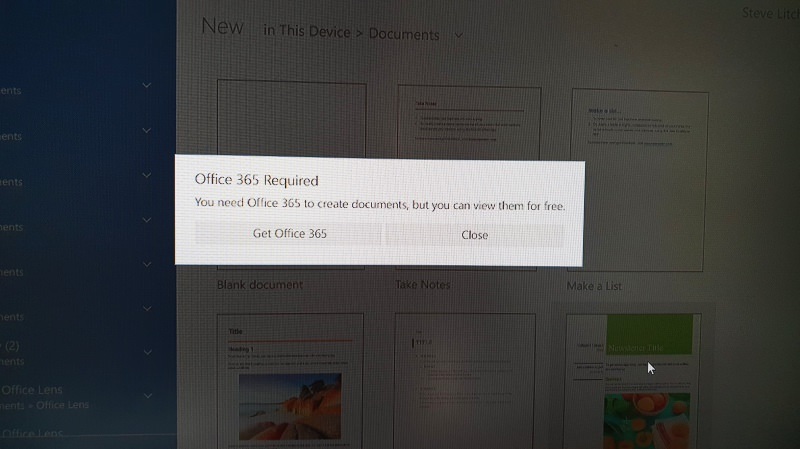 Boot up Word when using Continuum and you'll find that you can't edit or create without Office 365, as shown below. Well, at least this is consistent with the rules!